Wanna know what else I know? I know this because that used to be me! I used to live this crazy self-destructive lifestyle. I can tell you stories that will make your jaw-drop. Using the techniques and practices I now preach, I was able to turn in all around. When I first discovered that my purpose in life was to be of service to the world, I was super excited about the possibilities. I mean, who doesn't want leave their mark on the world? The minute I decided to put myself out there in a bigger way, I felt frozen with fear. What will people think? Who would pay attention to me? I felt like a fraud. I was terrified of being rejected, scared to death to ask people to buy my services, felt incredibly uncertain on what to kind of work to put out there. I felt like just giving up. There was already tons of people out there doing what I wanted to do and probably doing it better than I ever could so... why even try? I had self-induced insomnia staying up late at night wondering how I was going to make my dreams work. In a moment of desperation I decided to pray, I decided to surrender all my worries to the Universe. I decided to ask for guidance, courage, and strength. It wasn't that I wasn't good enough, creative enough, smart enough, special enough to realize my dreams, it was that I was entertaining thoughts and ideas that were blocking me. I wasn't looking at all of this from the wrong perspective. What I really needed was to learn how to see and think about things in a different light. See things how success-minded people do. I knew that if I didn't truly believe with every fiber in my body that I was destined for success, none of my dreams would come to fruition. I dug deep in the knowledge of dozens of dozens of books. I took up online classes at prestigious colleges. 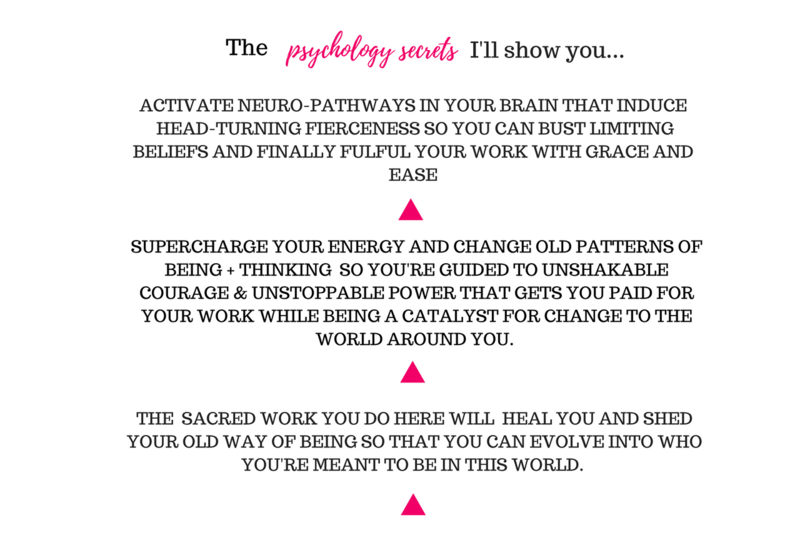 I became an Neuro-Linguistic Programming practitioner which is a fancy way of saying I learned to "speak the language" of the mind. I'm talking about techniques that take you from a state of fear to a state of excitement in the matter of minutes. Or tips to make you completely irresistible to others. And a bunch of insane hacks that get you to communicate with your mind with what you want it to do. I experimented like crazy until I finally got it all into a streamlined, easy-to-implement, process. Unstoppable power, unshakable courage, and crystal clear clarity on who I was, what I was doing, and where I was taking my business and life. Every thing changed for me. Fear ended up taking the back seat. I was able to to pitch my ideas, promote my work, create what I pleased, and also get paid, with confidence and ease. I saw the magic of co-creating with my higher-self show up in every area of my life. It became a fun and easy process to bring my dreams to life. And let me tell you, I'm just getting started! Now I'm gonna teach you how to do the same! Want to know my secrets? Hop on to my Secret Society list!